The morning after our port stop in Varna, Bulgaria, we were up early so as not to miss the Bosporus Strait a second time. 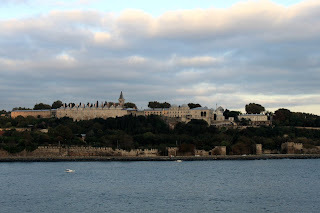 When we left Istanbul the week before, it was late at night and we were too tired to stay awake for the short sail up the 20 mile long Bosporus to the Black Sea. This was a much better day for it anyway since the sun was coming up and there would be some morning daylight to see the sights. The Bosporus connects the Black Sea with the Sea of Maramara and Istanbul sits right where it meets the Sea of Maramara. 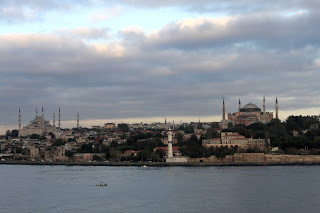 We were already entering the Bosporus when we got out of bed and headed up to the Lido deck for breakfast, camera in hand. Our travel guide on board ship narrated as we traveled past expensive old summer homes, castles, palaces, and fortifications. It was hard to pick out some of the buildings he spoke about since he was seeing them from the front of the ship and we were looking at them at the back of the ship. A few pictures of what to look for would have been nice. The one unmistakable landmark was Rumeli Hisari Fortress. It is a huge fortress that upon more research I found is even bigger than it appeared from the water. It is at the narrowest part of the Bosporus. Obviously a a strategic spot for what Sultan Mehmet had in mind for conquering Constantinople (Istanbul). His generals were in charge of building the various parts of the fortress and each was pitted against the other for who would finish first. 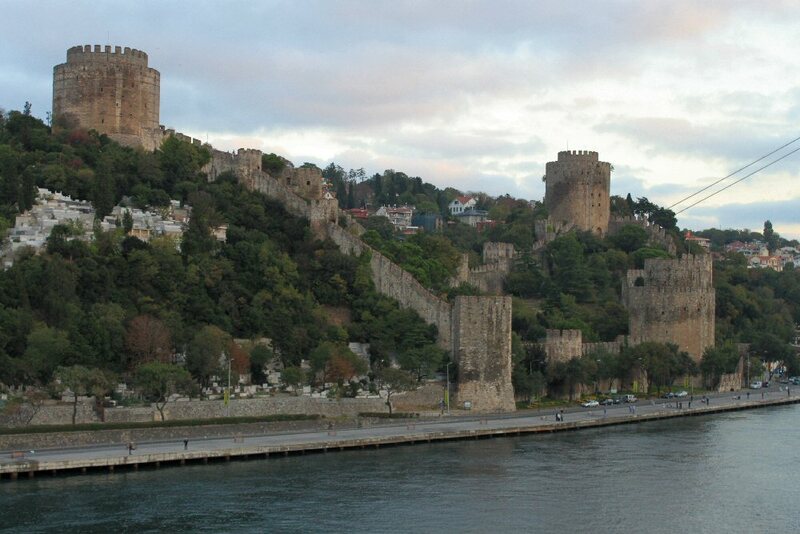 The fortress is open to the public and is on my list for our next stop in Istanbul. 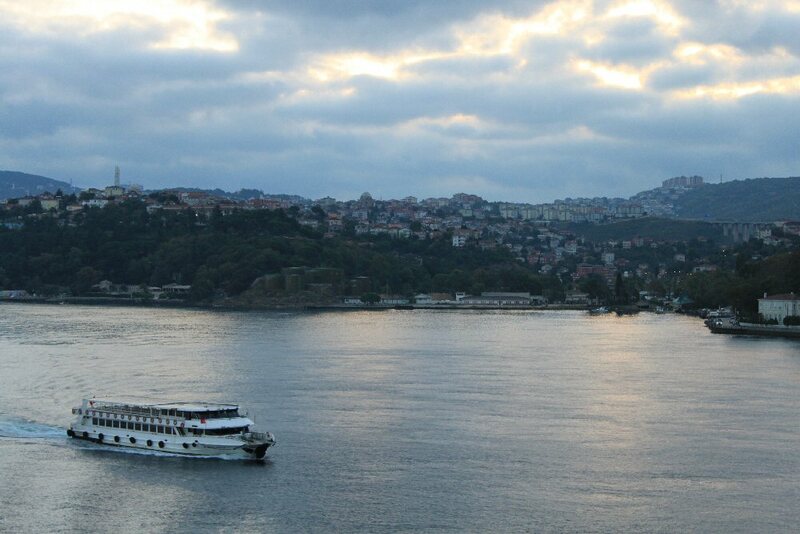 There are also lots of ways to cruise the Bosporus and see the area's sights by ferry boat and/or special tours. There were two bridges we needed to pass under. Since we were headed to Istanbul, the first bridge was actually the second--named Fatih Sultan Mehmet after the conqueror who ended Byzantine rule. 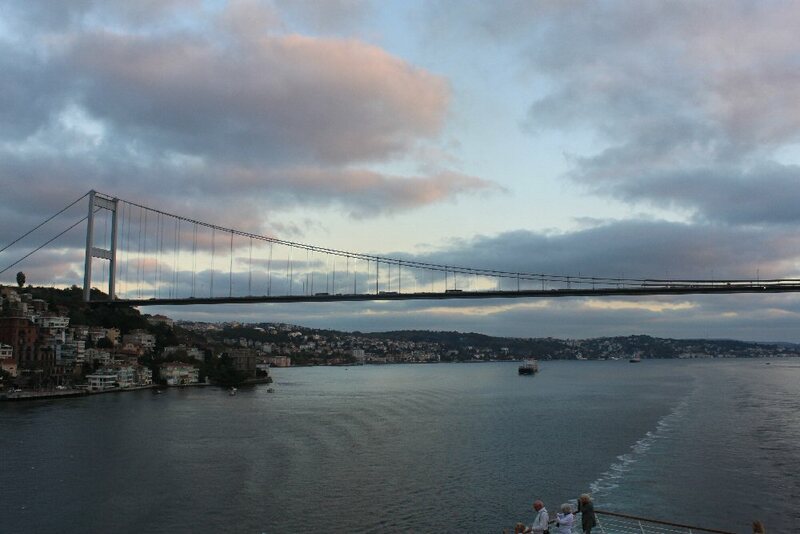 The bridge just before entering the Istanbul harbor is just called the Bosporus Bridge. It connects the European side with the Asian side of Istanbul. Of course once we were past the last bridge and by passing the port, we could once again see the familiar skyline of the old part of Istanbul. This time though we knew what each of the building were. 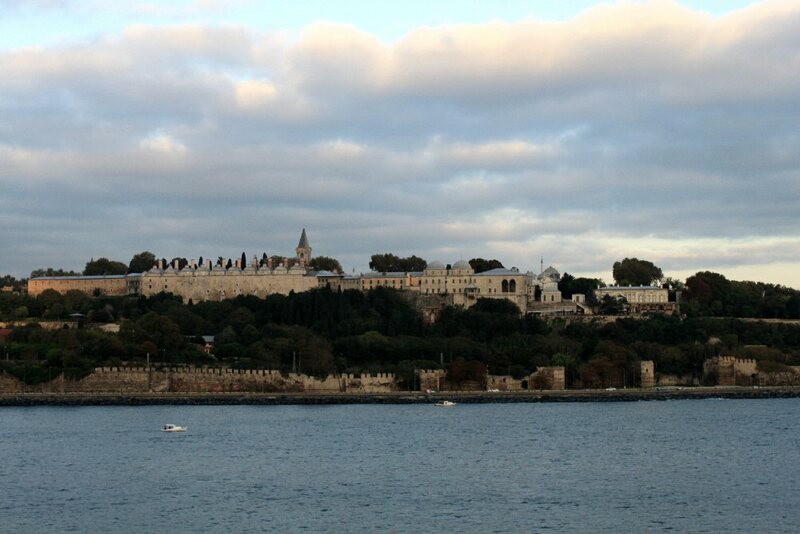 The Topkapi Palace stretched out along the shore. The Blue Mosque with its six minarets and of course, the magnificent Hagai Sophia. As I watched Istanbul disappear in the distance, I knew that we would need to return. Another cruise, another time.